It was now four years ago that hour long lines were flowing out the doors of Krispy Kreme’s West Croydon store, bringing SA’s very first taste of the warm glazed wonders that have a permanent place in our hearts. Now, we welcome a new glazed wonder, one which boasts an extra punch of indulgence that is bound to leave a smile on your choc-stained face. 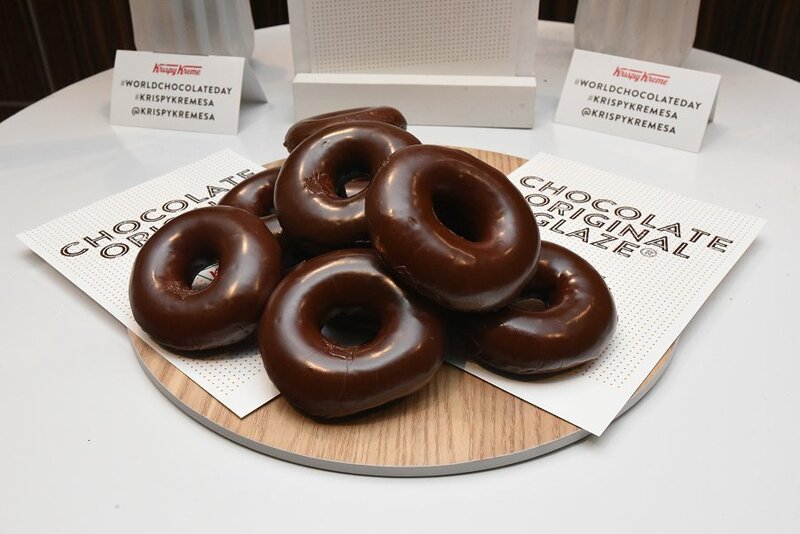 On Saturday July 7th, Krispy Kreme will celebrate World Chocolate Day! And with it comes copious amount of chocolate glazed doughnuts that bring a delightful twist to the traditional airy rings of dough. To celebrate, the first 200 customers to make their way through the doors from midnight onwards will receive a dozen limited edition choc-glazed doughnuts for absolutely nada. In a world where diet fads break our banks and raid our trolleys, it’s time to listen to the wise words of Willy Wonka himself, “Time is a precious thing, never waste it.” And by that he clearly means… treat yourself! Not only does the West Croydon store provide an opportunity for customers to watch, smell, and drawl through the creation process, all of their doughnuts are sold within a 24-hour time frame to ensure every bite is fresh, fluffy and full of love. Krispy Kreme are universally known for their delicious mysterious recipe that is well distinguished on the doughnut market—a recipe so secret, even the employees don’t question its formula. On that note, be sure to up your doughnut game and share the love this World Chocolate Day with limited-edition chocolatey goodness. A tantalizing treat which can only be described as “scrum-diddly-umptious”, the only thing you’ll regret is not saving some for later. Visit any of South Australia’s Krispy Kreme locations including Gouger Street, Grenfell Street and Westfield Marion to pick up a dozen or two on July 7th.